Our last visit to the vet with Lobo was a great success. He had a full exam, with blood taken, and he was only muzzled for a short while. This victory is the result of a long term plan, laid out since we adopted him over a year ago. Our goal of course is for him to not need a muzzle at all at the vet’s office. This boy, however, has a lifetime of fears to overcome. As a rescue dog with an unknown past, the path to comfortable vet visits is paved with patience, understanding and compassion. We do know one story when Lobo was being fostered at a doggy daycare center. Left alone at night, he tried to escape his pen and bloodied his paws and mouth in the process. He was discovered covered in blood and was taken to the vet on an emergency visit in a state of great anxiety and stress. We are not sure, but the mysterious scar under his chin may date from this sad event. Lobo loves his vet, without a doubt. All of our dogs do. Dr Marsha Smith is about as sweet and compassionate and laid back as a vet can be. Her love and respect for the animals in her care is obvious; she has a gentle manner that puts dogs at ease. Yet Lobo will wag his tail and bare his teeth at the same time when she tries to examine him. When we first took Lobo to her, he was merely accompanying our other two dogs for their checkups. He found a spot right by the door to the room and parked himself there, ready to bolt at the slightest crack of that door. Before each visit to Dr Smith, we stop at Wendy’s for hamburgers for the pack. We want Lobo to associate a visit to the doctor’s with something positive and special. These dogs get Wendy’s hamburgers at no other time except vet visits. On the second visit to the vet, Lobo snarled and bared his teeth when Dr Smith tried to examine him. We muzzled Lobo and tried to get a full exam to no avail. We could not get him to stay still, even in a headlock. We gave up after a short while, not wanting to stress him any further. The next visit to the vet’s was for the girls and not for Lobo. Easy peasy. The visit after that, was all for Lobo. He was really in need of a thorough exam. Dr Smith talked with us and the dogs for a while. Gave pets and bits of hamburger to all three dogs. And then my husband and I held Lobo firmly but gently while Dr Smith started the exam. He was, amazingly enough, fine with this. At first his heart rate sped up, but he calmed down once he realized that there was nothing to fear. We were careful to be calm ourselves, because dogs can read our emotions like a book. Now the true challenge, taking a sample of blood. The vet and tech had tried that unsuccessfully on Lobo’s other attempt at a checkup, to take blood from his back leg so he wouldn’t see what was going on. This time we decided to go for the front leg to eliminate the unknown, muzzle on for a short while, and us holding him. It worked like a charm. The muzzle was off in no time and he was enjoying more hamburger bits with the girls! We considered this vet visit a triumph. Next time we hope the muzzle is not necessary at all. Wish us luck! And please share any vet experiences of your own in the comments. Our latest foray into New Hampshire was blessed with cool mornings and evenings and warm, sun-kissed days. The longest day of the year was nigh and that was lovely too – we had glorious daylight until almost nine o’clock. Fiona, Secret and Lobo are great travelers. We create routine for them within the boundaries of travel and this is a key to happy, travel savvy dogs. How do we do this? The basic routines involve, quite simply, food and potty breaks. When we wake in the morning, whether it’s 6 am or 9 am, we walk all three dogs so they can pee and poop if they need to do so. They know this, expect this, and rely on this, as well they should. This typically means wandering around camp bleary eyed in our pajamas, with a roll of blue poop bags sticking out of my pocket, but camping is casual and that is fine for us. No matter how sleepy we are, we are watchful for critters (chipmunks, snakes, bears, frogs, other dogs, moose). Rob takes two dogs and I take one. Soon after we return to the camper, the tea kettle gets placed on the stove for me, and I begin preparing their bowls of food in our handy dandy bento bowls. At home, each dog is given his or her food bowl in a specific order and in a specific spot. This is how I create order and boundaries for meal times. I do the same in the camper – Fiona first by the dinette, Lobo next by the door, and Secret, third, is fed in the middle near the fridge. The dogs take a fish oil vitamin every morning in cream cheese and this is given before or after their breakfast. Lobo, ever vigilant for breaks in beloved routines, barks at me if I forget! The same routine is followed in the evening. Dinner is served somewhere between 5 pm and 7 pm. I like to vary the time – same goes with breakfast – so they learn to be a little flexible. Before we go to bed, they get a long walk around the campground to pee and poop. Then we settle in for the night of watching a movie, sitting by the campfire gazing at the flames, or falling blissfuly asleep to the tune of crickets and bullfrogs. 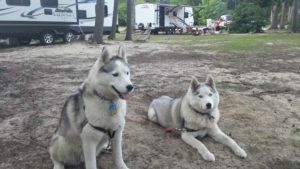 You will find dogs everywhere in campgrounds. On leash, off leash, in vehicles, in golf carts, in tents, in pop up campers, in travel trailers. It really is a dog lover’s paradise. This is why camping made such sense to us; it makes traveling with dogs easy. We’ve done the hotel stays with one dog or two and that was great, albeit expensive. 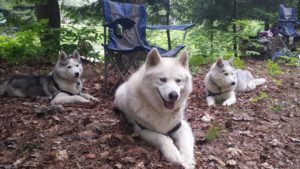 Now with three canines in our family, camping is the answer. Of course camping also means a lot of time spent outdoors, which we, as a family, love and appreciate. We discovered a great travel trailer “trick” on this last trip. The campground we were staying at has a policy, based on availability of course, where you can leave your trailer in place for two consecutive weekends, as long as you book and pay for the two weekends at once. To keep the electric on (and the items in your fridge and freezer cold) you pay a very minimal fee. So the camper waited for us patiently all week long and we didn’t have to drive it back and forth from New Jersey twice. It was like having a familiar vacation home waiting for us in another state. I guess this is why some folks have “seasonal” spots at campgrounds and just drop their trailer in place for the entire summer season. The savings in gas and tolls alone almost paid for our second weekend. When we drive with the trailer, we must stop at least every two hours to gas up. When we drive the car alone, it is every four or five hours. The difference in ease of travel (not having an extra 22 feet of vehicle in tow to maneuver) and savings (cut the gas expense in half) with not having something in tow is huge. Staying two weekends in a place satisfies our desire to get to know a place better by staying longer. This pack is ready to travel! Classical music has always been a part of my life. My father listened all day long on the radio, played Beethoven sonatas on the piano from memory, and brought the family to Carnegie Hall for concerts as much as we kids would tolerate it. As an adult, I am now an avid listener. 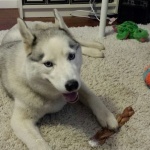 Would playing classical music in the house help our foster boy Lobo to relax? When we first met Lobo, we were told he had anxiety and would benefit from doggie daycare while we were at work. We were told he was very destructive, an escape artist, didn’t get along with all dogs, had bitten one or two people, and might be anxious or fearful if left at home without people. His past record had proven this to be true; in a stabile home environment, with two loving sister dogs, and two doting pet parents, we felt that this could change. If we were to adopt Lobo, he needed to get along with Fiona and Secret. We needed to feel confident that he would not hurt them or the house and that he wasn’t fearful for himself while we were not at home. We were a bit taken aback at the laundry list of challenges, but we felt we saw the inner dog. The pups meet for the first time. Imagine three pups left alone in a completely silent house. For eight hours. A little noise might be most welcome! Quiet strains of violins and cellos fill the air. Classical music can of course be very soothing. I recall as a kid I would sometimes become so relaxed that I would nod off during a performance. I was deathly afraid of falling asleep and tumbling over the balcony rail onto the people below in the orchestra seats… That of course never happened! However, what I came to understand is that a well-played symphony or sonata can induce a deep, almost meditative state which is very calming and restorative. I now look forward to concerts as time for reflection as well as appreciation of fine music – and I do still nod off sometimes! Knowing Lobo suffered from anxiety, we thought classical music might hold the key to helping him relax in his new environment. If music soothes the savage breast, would it prevent our Lobo from having a freak out when we were not home? For a resource, I turned to what I’d known from childhood: WQXR, the classical music radio station of New York. My father built a crystal set to listen to this station when he was a kid – it’s been around for over 70 years. 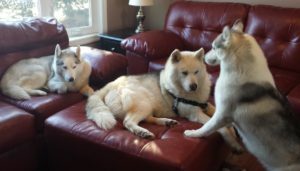 Lobo, Fiona and Secret could chill all day listening to Beethoven, Brahms and Bach and skilled announcers with soothing voices. I crossed my fingers and hoped Beethoven and his brethren would work their magic on our big fella Lobo. 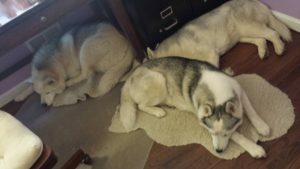 The first week we experimented with four hours of day care for Lobo and four hours home alone with Fiona and Secret and classical music radio. I arrived home full of trepidation and found… nothing wrong. All three dogs happy to see me, but no bleeding, limping, piles of poop or puddles of pee, no couches torn asunder or molding chewed to shreds. I breathed a heavy sigh of relief. What we discovered under Lobo’s big dog exterior, is a sweet boy who can play a little rough and likes to bark loudly at times, but whose heart is pure gold. He is obedient, coming inside whenever we call, and loves to stay near his humans in the house, even when the other dogs are outside. He is very troubled whenever I sneeze – he rushes to me, looks at me with a clearly worried expression, and wags his tail nervously, even jumps in my lap sometimes. I have to sneeze now with caution! This dog was so worthy of love and attention – what dog is not? – and his loving nature spoke to us louder than words. We worried about the effect of adding him to the pack; would our two girls be happy with this new addition? The second week we went full force with our hopeful experiment. We left the dogs alone together all day, 8 1/2 hours, while we were at work. I prayed that it would be okay. That no dog would come to harm. And that Lobo was not anxious or afraid. And that our living room and kitchen furniture would be intact. When I arrived home, a bit early because I was nervous, all three dogs were thankfully fine. What did this mean? It meant that we could officially adopt Lobo, who is now a happy member of the pack. Lobo in play mode with the girls. Looking back a year later, I see a pack of three dogs who love each other and get along very well. Like all siblings they have their differences, but at the end of the night they always cuddle up together very sweetly. We have begun traveling with them and they have adopted the camping trailer easily as a second home away from home. They are a united force, adaptable and happy in their shared bond of family. Is it the classical music they listen to all day which has led to harmony in the pack? I am sure it is a contributing factor. Once a routine is established, dogs fit into it quite comfortably. 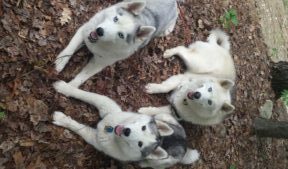 The classical music playing in the house has become part of the familiar routine for Lobo and the girls, along with giving them cookies before we leave the house, and letting them out into the yard as soon as we get home. 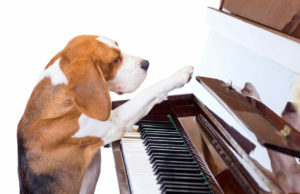 Thank you, Beethoven, for bringing the inner dog out to shine in our sweet Lobo! 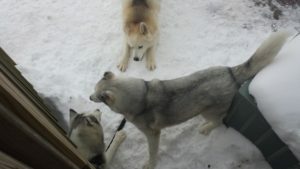 I can safely safe the girls are happy that Lobo is part of the pack. Most dogs have little to fear in a loving home. But some have serious issues with a few select things, despite their happy and secure circumstances; they involve going to the vet, going to the groomer and traveling. All of these mean leaving home and familiar surroundings. If your dog doesn’t get out much, and the few times he does he goes to the vet for shots or bloodwork (things we humans often dread), he may begin to fear leaving the house and even going for rides in a car. 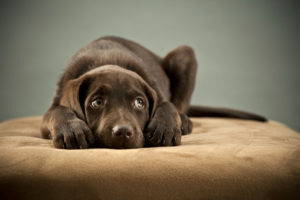 Dogs need a variety of experiences or they become like shut ins, afraid of new experiences and blinking at the sunlight. If your dog goes on fun trips to the dog park, exciting visits to the local pet store and adventurous hikes in the forest, he may associate leaving the house with positive experiences more than negative. Breaking up the routine is a good lesson as it teaches your dog to be adaptable and not fear what is new or uncommon in his or her life. 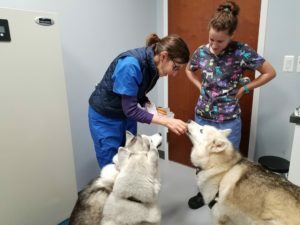 We’ve tried a new tactic with going to the vet – packing a few hamburgers in my backpack… We bring a few fast food hamburgers with us and give them to the vet to dole out during the visit. It raises the level of excitement in a positive way. Our dogs never get hamburgers any other time, so the vet is associated with something very special indeed. It’s so important for dogs to be comfortable with their vet. The more comfortable they are, the better the care they can accept. If a dog is fearful, it is not easy to examine him and get the routine care which is vital for detecting health issues early on. Our boy Lobo is still somewhat fearful but he is getting more relaxed every time we go to the vet. When we first fostered Lobo, he was a very barky dog. It was the main reason he was having trouble finding a forever home. He would tilt his head, look you right in the eye, and bark loudly at you. It almost seemed aggressive, except it was often accompanied by a wagging tail. Lobo has a long, thick, curly tail and each wag is a noticeable swish. At 75 pounds, he is the biggest dog I’ve every lived with. His bark was a bit intimidating. 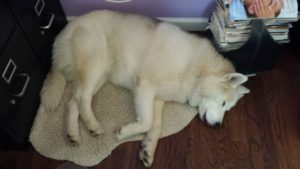 I remember sitting down to do some work at my computer and Lobo came up to me and barked and barked and barked, pawing at me with his big, lion-like paws. I thought to myself, I’ll never get any work done. This won’t do. He doesn’t like me working at my computer. I emailed the rescue group and asked about it. Patience, they wisely counseled, patience; this is an adjustment period – give it time. The rescue group was, of course, so right. 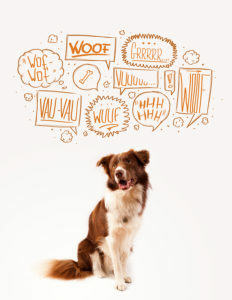 All the barks sound the same, but the situations vary. Slowly we figured them out, one by one. If you ever saw the movie about Helen Keller, The Miracle Worker, it made me think of when Helen understood the word for “water” for the first time – light breaking through the darkness, sound through silence. Each discovery with Lobo was a eureka moment, when the light bulb went on in our brains, and Lobo wagged happily because we had patiently learned another few words of his rather loud language. It seems that one bark means, I need water. And another very similar bark means, I need to go outside and do business. And another means, it’s time for food. And another means, it’s time for bed. And yet another means, I need love and pets. A few barks were as yet undefined. When a dog first comes to your home, he has no idea what the routine is – will you feed me on a regular basis? Will I have regular bathroom breaks or walks? Once we established a familiar routine with Lobo, we generally anticipated his wants and he had very little need to bark for our attention. We’ve learned that when Lobo does bark, it’s usually for a darn good reason. One time he barked because I’d turned on the oven and forgotten I had left a pan in there which had begun to smoke – thanks, Lobo, you’re a life saver! The barking incidents went from 100% mystery, down to about 10%. And there it remains. A dog deserves some air of mystery! The small percentage of undefined barking incidents are easily diffused by distractions like hugs. Barking is after all, his language, and we have no desire to silence his speech entirely – just keep it to reasonable intervals, and decibels. 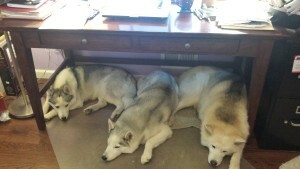 Lobo and his sisters relax under my desk. We have since adopted Lobo. His favorite spot to relax is lying under my desk while I work at my computer! We’ve come a long way since those initial barky bark moments. The beautiful thing is we are closer now, Lobo and his people, for having taken the time to get to know each other.